PC users cringed at the news that the Windows 8 app store has just 2,000 apps ready to go, but fear not: The free AMD AppZone store is today bringing 500,000 Android apps to PCs. 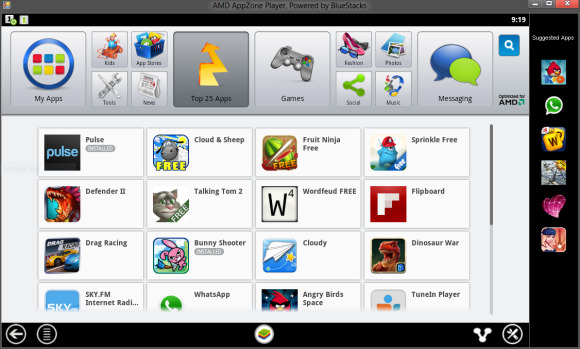 Software developer BlueStacks and partner AMD are touting the AMD AppZone store as the biggest collection of PC-compatible Android apps, which range from games and news to productivity tools and antivirus software. About 50 of the apps are free to download. BlueStacks last year put out their Android x86 app player and attracted investment from AMD. The two took BlueStacks’ original player, which was designed for Intel PCs, and expanded its use to AMD-powered PCs. AMD produces accelerated processing units for PC and gaming console manufacturers. Competing aggressively with Intel, today AMD also announced its new Trinity APU, which ships Oct. 2. The company said it plans to partner with PC OEMs to preload AppZone and selected apps onto new PCs going forward. Intel also has its own app store, AppUp. AMD claims its store has more apps than AppUp and the Windows 8 store. In a statement, BlueStacks CEO Rosen Sharma said the company is gearing up for the launch of Windows 8, which will bring a touch-screen, app-friendly interface to many PCs, by bringing a wide selection of Android apps to the PC market. For now, apps can be controlled using mouses and keyboards. Android smartphone users can transfer their mobile apps to their PCs using BlueStacks’ Cloud Connect app.